Rock Paintings. Cave of Altamira, Spain. Steppe wisents. Souvenir sheet. Rock Paintings. Cave of Altamira, Spain. Steppe wisent. Prehistoric Paintings. Cave of Altamira, Spain. Steppe wisents. Prehistoric Paintings. Cave of Niaux, France. Steppe wisents. Souvenir sheet. Prehistoric Paintings. Cave of Altamira, Spain. Steppe wisent. Souvenir sheet. 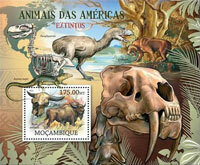 Extinct Animals of America. Ancient bison (Bison antiquus). Paleolit, Cave Paintings. Cave of Altamira, Spain. Steppe wisent. Paleolit, Cave Paintings. Cave of Niaux, France. Steppe wisent. Paleolit, Cave Paintings. Font-de-Gaume, France. Steppe wisent. Souvenir sheet. 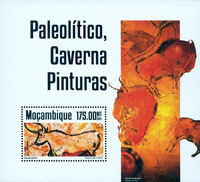 Paleolit, Cave Paintings. Lascaux Caves, France. Bos primigenius. 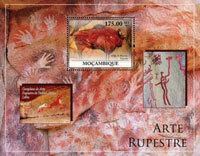 Steppe wisents from Cave of Altamira, Spain on margin of the sheet.